The Hampton Inn Greenville/Simpsonville hotel in South Carolina is located off I-385 Exit 27 just minutes from Mauldin Fountain Inn Laurens and downtown Greenville South Carolina. Attractions in the Greenville/Simpsonville area include business parks Heritage Park and the Discovery Water Park. Dining options in Simpsonville include Applebee*s Ruby Tuesday*s Cracker Barrel Arizona Steak House O Charley*s Moe*s Mexican Ryan*s and many others within a mile of the hotel. The Hampton Inn Greenville/Simpsonville hotel has 84-rooms that include all the amenities of home. The hotel offers our signature On the House breakfast that is complimentary and served every morning from 6am to 10pm. We also offer complimentary use of our onsite fitness center outdoor pool and high-speed wireless internet access. All king studies are equipped with a 48** working desk and voicemail. The Hampton Inn features 2-room suites which have a separate living room and dining area with refrigerator and microwave. All of our rooms offer complimentary local phone calls in-room coffeemaker hair dryer and TV. 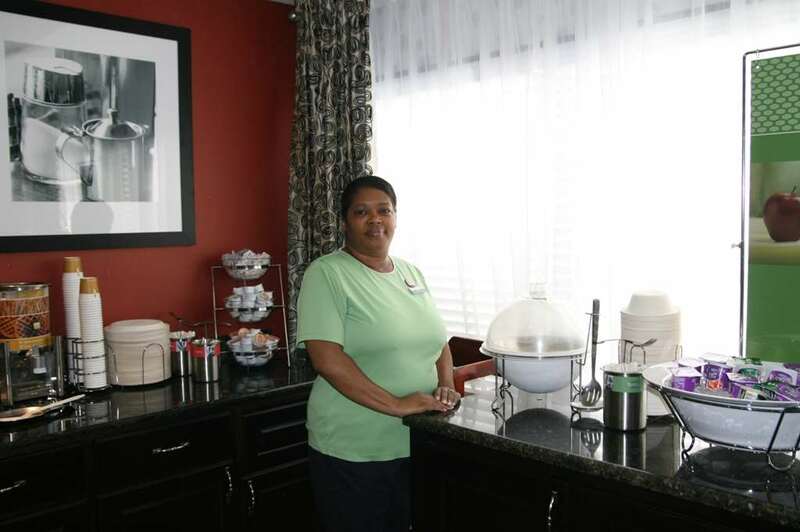 We love having you here at the Hampton Inn Greenville/Simpsonville hotel in South Carolina.